Summer 2017 saw at least 58 acts of protest either staged by women or actively participated by them. This is an average of almost 19 protests per month, which denotes a significant rise compared to the average 8.5 women’s protests in 2016. Twenty-seven protests took place in the month of September, 20 in the month of August and 11 in July. 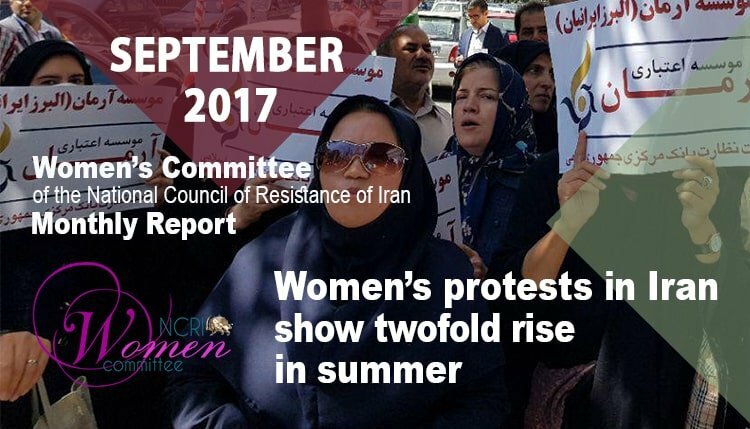 These months coincided with massive crackdown campaigns on women as the ruling misogynous regime attempted to curb women’s tendency to somehow get rid of the mandatory veil in the heat of summer. The numbers – compiled and registered from reports appearing in the social networks and disseminated by independent popular sources on the internet — should be considered way below the actual number of protests as the Iranian regime censors reports of such protests and does not report them by its official media outlets. The rise in the number of protests is particularly due to the large number of protests and sit-ins staged by those who have suffered losses at the hands of government-backed financial institutes. Women have actively participated in numerous protests in cities across the country, in front of the Iranian parliament (Majlis), and the Central Bank in Tehran to demand refund of their deposits plundered by financial institutes such as Caspian, Arman, Padideh, etc. The protests included a sit-in in Mashhad (northeast of Iran), September 24, simultaneous protest rallies in seven cities of Tehran, Mashhad, Shiraz (south of Iran), Isfahan (central Iran), Ahwaz (southwest of Iran), Boushehr (south of Iran) and Malayer (west of Iran) on September 26, as well as protests in Tehran, on September 23, September 11, August 29, August 16, August 13, August 6, and July 23, Neyshabur (northeast of Iran), July 23, and Mashhad, July 11. Earlier on June 29, including large numbers of women staged protest rallies in different cities, including Mashhad, Zahedan (southeast of Iran), Sorkhrood (in northern Mazandaran Province), Rasht (north of Iran), Ahwaz and Nahavand (west of Iran). The nurses’ community staged nationwide protests in cities across the country on August 6 in protest to a plan by the Ministry of Health intending to train nurses in hospitals rather than universities. They called for termination of this plan which they say will take back the country’s nursing system at least 50 years and is against all economic standards. Other protests in July, August and September concerned the nurses’ past-due salaries and overtime wages. The protesters had not received their salaries from six to 11 months. In the meantime, officials of the Nursing Organization have acknowledged that the pay gap between nurses and doctors is 100 folds in Iran as compared to a maximum of three folds in most other countries. Nurses staged 13 protests in Dehdasht (southwest of Iran), September 27, Boushehr, August 24, a nationwide protest on August 6, in Tehran, Shiraz, Isfahan, Khorasgan (central Iran), Najafabad (central Iran), Falavarjan (central Iran), Ahwaz, and Bojnourd (northeast of Iran), Semnan (north central Iran), July 16-17, and Tehran, July 10. Women make up almost half of the teachers’ community in Iran. They have been staging constant protests over the past two years demanding formal full-time employment by the Ministry of Education, insurance, payment of their past-due salaries, and raise in their meager wages. They have demanded release of imprisoned teachers’ rights activists, insurance for teachers, balancing of retirement pensions, elimination of discrimination, full implementation of Article 41 of the Labor Act, and the immediate increase of the salaries of working teachers and retired teachers according to the Minimum Expenditure Basket (MEB). Teachers are grossly underpaid. The monthly salary of teachers is between 300 to 450,000 toumans ($90-135), way below the minimum wage of 930,000 toumans ($280), and the poverty line standing at more than 3million toumans ($900). These meager salaries are usually not paid for six to nine months. Women have participated in six acts of protest over the past three months in cities of Sari (northern Iran), September 10, Kermanshah (western Iran), September 5, Golestan (northern Iran), September 4, Tehran, August 22, Kerman (southern Iran), July 13, and Yasouj (southwest of Iran), July 11. Young women studying in the universities held at least five protests in the three months of summer demanding improvement of educational space, quality, and living conditions in dormitories. Girl students in Hamedan’s Bou Ali University (western Iran) staged a protest on September 24, against the sub-standard living conditions in their dormitories. Students of Jondishapur School of Dentistry in Ahwaz (southwestern Iran) held a protest rally on September 26. This was the second time the girl students in this university were protesting the lack of educational space. A group of Iranian women, students of anesthesiology and assistant anesthesiologists of the Medical Sciences University of Shiraz (southern Iran), staged a gathering outside the Medical School on September 12, and protested reduction of anesthesia tariffs. Girl students volunteering to train as dental assistants held a protest outside the Ministry of Health in Tehran on August 26, objecting to the choice of national books on dentistry as the source used for drafting the Dental Assistant Exam. Girl students of the Medical School of Azad University in Shahrood (northeastern Iran) refused to attend their exam on July 24, and staged a protest gathering instead against bad educational conditions. On at least 12 other occasions, women spoke out and staged protests for different causes. A number of women held a protest rally in front of Tehran’s Telecommunications Company on Friday, September 29. The protesters have been waiting for over 16 years to have apartments built for them. Women actively participated in a protest gathering in Tehran on September 27, in support of imprisoned unionist Reza Shahabi, head of the Syndicate of the Bus Company of Tehran and Suburbs, and demanded his immediate release. Retired women held two simultaneous protests in Tehran and Sari (capital of Mazandaran Province in northern Iran) on September 16, demanding pay raise. In Tehran, more than 2000 protesters were joined by colleagues from the provinces of Isfahan, Central, south, north and Razavi Khorassan, Gilan, Mazandaran, Kermanshah, and Alborz. The arbitrary killing of Kurdish porters by security forces were protested in the Kurdistan of Iran by a group of Kurdish women in Baneh, on September 7, and in Mahabad. on September 10. Also a number of women climbed the Damavand mountain, north of Tehran, to pay tribute to the defenseless porters. A number of protesters hacked the Azadi Stadium’s website on September 6, after Iranian women were not allowed to enter the stadium to watch the football match between the national teams of Iran and Syria the day before, while Syrian women were allowed in. Four activist women calling for repeal of the death sentence issued for Iranian prisoner of conscience Mohammad Ali Taheri were arrested on August 28, 2017 in front of Tehran’s Evin Prison. A number of women also gathered outside Tehran’s Revolutionary Court on August 27 for the same reason. In a statement issued on August 31, Laleh Park Mothers called for prosecution of the Iranian regime leaders responsible for the massacre of political prisoners in Iran in summer 1988. On August 13, 2017, the people and particularly women of Dezful, southwestern Iran, staged a gathering in front of the Governor’s Office to protest against construction of a water channel which diverts the city’s water and transfers it from the Dez River to Andimeshk. Prisoners of conscience and political prisoners spoke out from behind the bars and engaged in acts of protest on at least five occasions. In an act of protest to being handcuffed and shackled in hospital and under operation, political prisoner Atena Daemi refused to undergo gallbladder surgery on September 25. Melika Kavandi and Zahra Shafii Dehaghani have gone on dry hunger strike since September 19 in protest to being detained there without being informed of their charges and determination of their status. The two women had been arrested 23 days for protesting the death sentence issued for the prisoner of conscience Mohammad Ali Taheri. Evin political prisoners Atena Daemi, Golrokh Ebrahimi Iraee and Maryam Akbari Monfared, published an open letter on August 19, calling on conscientious people to speak out against the difficult conditions of political prisoners in Gohardasht Prison who were on hunger strike. The clerical regime organized a guided tour of Evin Prison for ambassadors of 45 countries on July 5. Subsequently, political prisoners Maryam Akbari, Golrokh Iraee and Atena Daemi wrote open letters to the ambassadors and explained the intolerable conditions of Evin Prison.